Who doesn't love shiny things? I do, a lot. 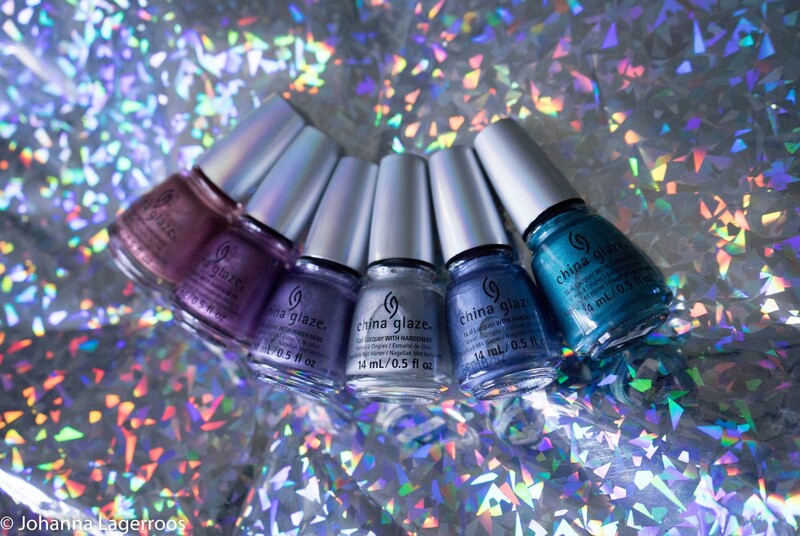 So when China Glaze announced they're bringing back polishes from ten years ago - and they would be more or less holo - I knew I had to get them. For once the collection is only six bottles big so I could somewhat justify getting them all. Don't you just love the way they look? I had saved this holo envelope from a previous blog thing and now I know why. It makes the perfect prop for this post. I like that the bottles have sort of holo caps as well, it goes nicely with the theme. These shades inspired me the minute I unboxed them, and I think I can get quite a bit use out of them. The polishes don't show all the holographic goodness in the bottles, but swatching gave me some idea how bright the rainbow is in each one. 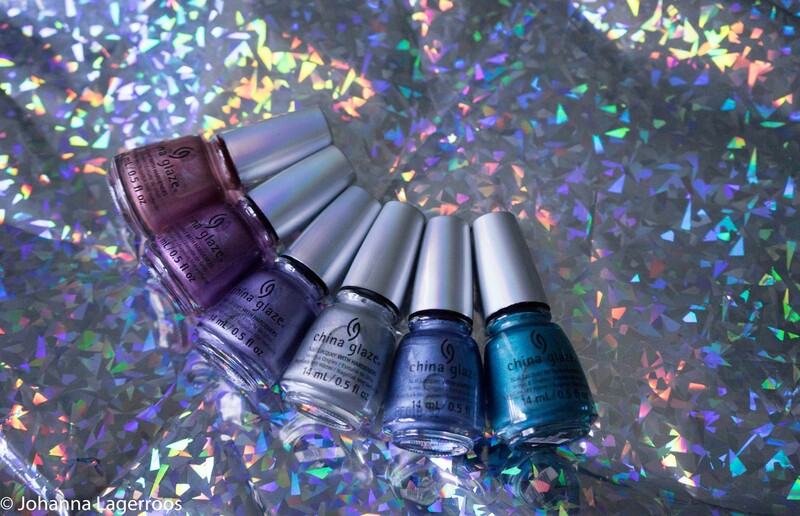 In case you've never tried photographing holos, capturing the rainbow is tricky to say the least. I've learned that phone flash gives a better result than daylight or ring light and so on, but I wanted to show these in daylight still. I have uploaded some flash swatches on my Instagram Stories, so the holo goodness continues there. However in the above pic you can see how the swatches are in the broad daylight. 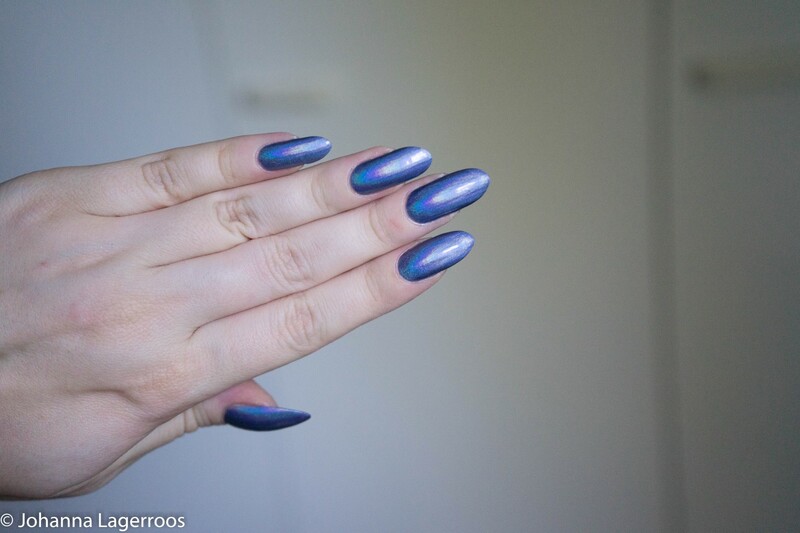 They are metallic fun even when the lighting doesn't show all the holo beauty. Below, I swatched two of the polishes on my own nails to see how the polishes behave in use. First I have pictures of 2nite on my nails. I used 2 coats for an opaque look. 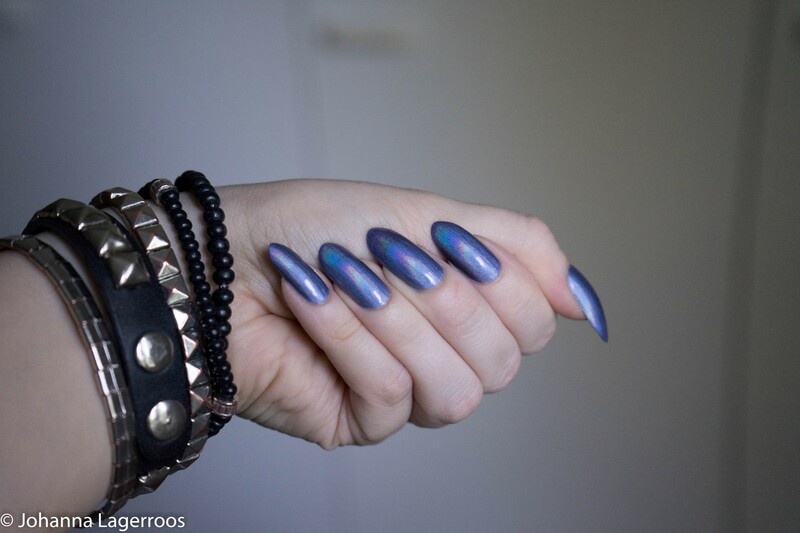 This one had quite visible rainbow shine even in the daylight once it was on the nails. The polish is little tricky to work with as it tends to apply little streaky if you're sloppy with it. But with patience, it works well enough not to be unwearable. This really was fun to wear and it lasted nicely as well. Nothing bad to say about it. 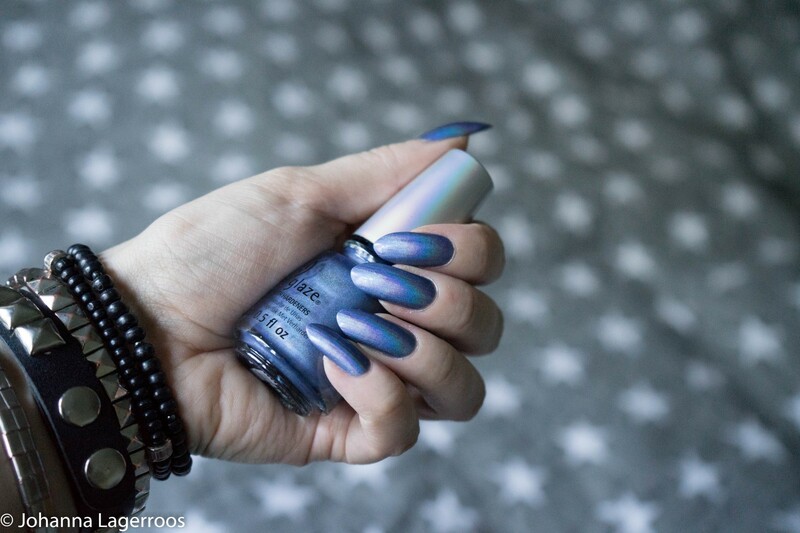 2nite is cool blue holo polish and something that could be used for fun galaxy nails or something ocean inspired. The second swatch is of BFF, which is a magenta holo polish. This one didn't show the rainbow as well in the daylight, but it definitely shows under flash. 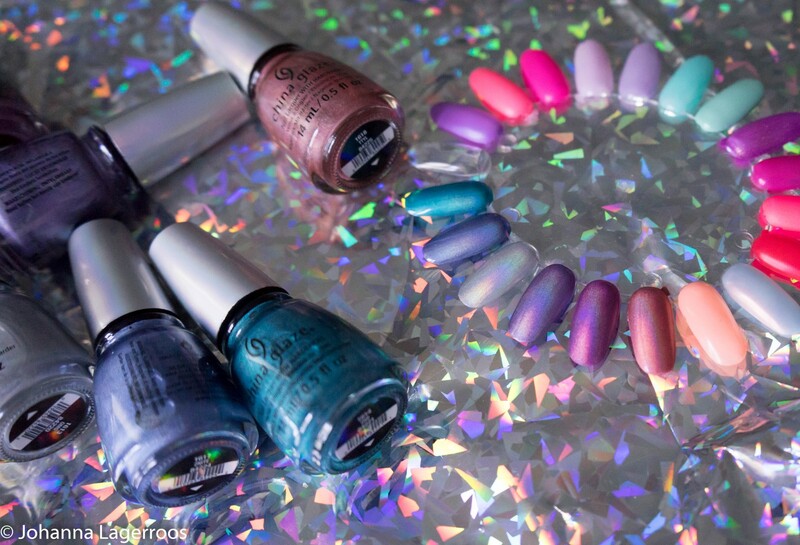 But even if this is maybe not the brightest holo, it is pretty and fun to wear. I could see this one in Valentine's Day nails or other cute designs, as well as maybe in some galaxy nails. Side note: Rest in peace to my pinky nail that awkwardly decided to snap on Saturday. I did my best to make it less noticeable. BFF got opaque in two coats as well, and was similar to work with than 2nite. (If you wonder about the names, the come for texting abbreviations popular 10 years ago when this collection was originally released.) I'm looking forward to play more with this collection, and I will be posting more at least on Instagram - so follow me on @silvertigo or @silvertigonails to see all that! 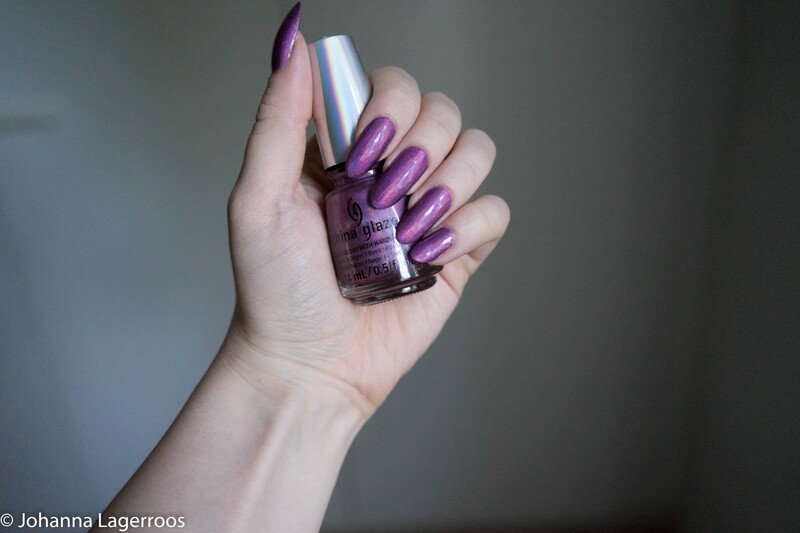 What do you think about these polishes? And, what's on you nails today? Let me know in the comments! That's all for today, and as I'm typing this I'm excited since in 4 weeks, we're going to get a cat. Today also marks two weeks until my summer holiday of three weeks, during which time I can get the cat used to the new home and all. I have three posts planned concerning the cat, and I hope you will enjoy reading them during the autumn. It's also almost the time to get the autumn wardrobe post up, I'm planning on organizing and shooting it new weekend unless I get busy with other things. New blog post will be up on Tuesday unless stated otherwise, so stay tuned for that!